I’m not sure what sparked my husband’s idea for Chicken Cordon Bleu-inspired panini this weekend but it was absolutely brilliant. Crispy panko-crusted chicken breast, layered with smoked ham, Swiss cheese and a sweet-and-tangy honey mustard sauce, grilled on French bread? Yes, please! It sure has been a long time since I last had Chicken Cordon Bleu. It’s kind of one of those classics you don’t really see on restaurant menus too often anymore but a lot of people still make it at home. I have a scary hunch that my most recent one might have been a microwaved airplane version, smothered in a white sauce. Sadly, even that was kind of good. When that smoky flavor from the ham works its way into the chicken and the cheese gets all melty inside – well, the dish is almost always a winner in my book. 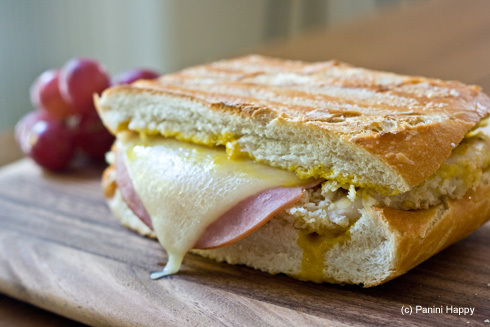 The components of Chicken Cordon Bleu lend themselves perfectly to panini – I should have made these a long time ago. Add a fresh salad and you’ve got a relatively quick and easy weeknight dinner! Heat the olive oil and butter in a large sauté pan over medium-high heat. Set up a dredging station for the chicken by placing the flour, egg and panko bread crumbs each in separate shallow dishes. Season the chicken with salt and pepper and dredge each piece in the flour, egg and bread crumbs. Place the breaded chicken into the pan and sauté for about 4 minutes per side until cooked thoroughly. Transfer the chicken to a cutting board and set aside. In a small bowl, whisk together mustard, honey, corn syrup, mayonnaise and dried onion flakes. Set aside (or refrigerate if not using immediately). Preheat the panini grill to medium-high heat (375°). For each sandwich: Half the bread lengthwise. Spread honey mustard sauce inside both halves. On the bottom half, layer a chicken breast, a slice of ham and a slice of cheese. Close the sandwich. Grill panini for 3-4 minutes until the cheese is melted. Serve immediately and enjoy! Pumpkin, Duck Confit & Feta Panini — Celebrating 100 Panini! Oh yes please indeed! You know I would have put those grapes inside the panini, I know weird. .-= dawn´s last blog ..pineapple-bacon crackers =-. I need that for dinner right now!!!! .-= Emily (A Nutritionist Eats)´s last blog ..Mediterranean Rice Salad =-. This would fast become a classic panini!!!! Chicken Cordon Bleu is one of our favorite things. We make it a lot at home, but I never would have thought to put it on a panini! Sounds awesome. AND I’m really happy you linked that Aussie Chicken recipe because it’s what I order every time we’re at Outback and I’ve always wanted to find a copycat- thanks! .-= Sara @ Our Best Bites´s last blog ..Indian-Spiced Pork Skewers =-. .-= marguerite´s last blog ..Antipasto Pie =-. .-= Tracy´s last blog ..Sesame Chicken =-. What an awesome idea! Sounds great. How are things? Well I hope! .-= Emily´s last blog ..WEEK 12: Mediterranean Pizza =-. Ohhhhh congrats Kathy!!! That is wonderful news 🙂 You will share pictures when he arrives won’t you? Love that second picture. You have a great eye. .-= The Duo Dishes´s last blog ..Don’t Knock It ‘Til You Try It =-. I don’t care how old-fashioned it is, I adore chicken Cordon Bleu! This looks great. .-= Arlene´s last blog ..LOBSTER WITH SCALLION GINGER SAUCE =-. Mmm I haven’t had that in ages but I agree with you – any dish with melted cheese is A-OK! .-= maris´s last blog ..You Say Potato, I Say Bacon Potato Salad =-. This looks great! I would have never thought to make a panini out of this one! .-= Ashley´s last blog ..Grilled Ribeye with Cherry Balsamic Chanterelle Sauce =-. Looks so perfect done! so slick and looks delicious too! .-= Big Boys Oven´s last blog ..Emmanuel Stroobant Home Cooking Series =-. .-= Kitchen Butterfly´s last blog ..Pear Tarte Tatin…my inspiration =-. .-= Farmgirl Susan´s last blog ..Wednesday Dose of Cute: Smile for the Camera =-. Fantastic! There should be plenty of ideas to get you started! 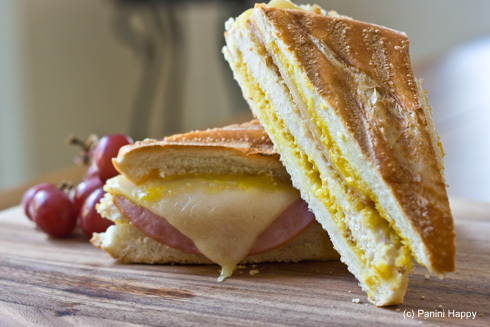 Next post: WIN a Breville Panini Grill in the “Top Panini Chef” Challenge!